Ljubomir Tanchev was born in 1945 in Prilep (Republic of Macedonia). He moved to Skopje in 1950 where he finished the primary and secondary school and graduated in Civil Engineering from the Sts Cyril and Methodius University, Skopje. He obtained his M.Sc. in 1980 and was awarded his Ph.D. on the subject of Numerical analysis of embankment dams from the same university in 1987. In 1978/79 he completed a post-graduate study at IHE in Delft, The Netherlands. He began his career working in the laboratory for testing of materials of the CC "Mavrovo" (Skopje) as a research engineer between 1972 and 1977. Then he joined the Sts Cyril and Methodius University, Faculty of Civil Engineering, as assistant. In 1988 he was appointed Assistant Professor, in 1992 Associate Professor and in 1996 Professor, covering the topics of Dams and Hydraulic Structures. He has been Head of the Department of Hydraulic Structures, vice-Dean and from October 1999 till October 2003 Dean of the Faculty of Civil Engineering, Sts Cyril and Methodius University. He retired in October 2010, but is still active in various projects. He was president of the Macedonian Committee on Large Dams (a member of ICOLD) from May 2004 till June 2013. Over his 40 years of practice, Professor Tanchev has been involved in many hydraulic engineering projects as a designer, consultant, and supervisor. He has published more than 50 scientific works and he is the author of three books published in Macedonian: Static analysis of embankment dams (1989), Hydraulic structures (1992) and Dams and appurtenant hydraulic structures (1999). For the latter book, Prof. Tanchev was awarded the Goce Delchev Prize, the highest state prize for achievement in the sciences. The first English edition of Dams and Appurtenant Hydraulic Structures was published in 2005 by CRC Press / Balkema. Because of the simple and straightforward language used by the author throughout the text, reading this book is very pleasant. The book’s content covers a wide range of disciplines including the initial studies for implementation of the dam, design, construction and operation of hydraulic schemes. The most important issues of design and construction of dams and associated structures are analysed and described in depth, giving the reader a complete overview on the subject. The presentation of the themes is done in a didactic way, and the book can be used as a manual for engineering of dams. […] All chapters are profusely documented with drawings, charts, and photos of recent examples of achievement. Figures and photographs are of high quality. […] In short, the updated edition is an indispensable tool for both advanced students and practising engineers of design and operation of dams and appurtenant hydraulic structures. The first edition of the Dams and Appurtenant Hydraulic Structures treatise […] was in my opinion one of the best ever books written on dams, providing a complete and comprehensive picture of dams and the appurtenant hydraulic structures which are essential for their safety. I am pleasantly surprised that after only 10 years the author brings to the dam community an even better book, the second revised and enriched edition. The prime added value of this new edition is the extension of the embankment dam part, focusing on new achievements in concepts and on updated methods of analysis. Special attention is given to the advanced methods of static and dynamic analysis of embankment dams. All valuable papers in the field are reviewed and pertinent syntheses are included in the book. The second major contribution of the new edition is the chapters concerning the new types of concrete dams - roller-compacted concrete gravity dams, hardfill dams and roller-compacted concrete arch dams. I strongly recommend the book to professionals. It is also an excellent textbook for (graduate) students in civil, hydraulic and environmental engineering. The reader will find that the book provides a wealth of examples of all kinds of existing dam projects worldwide. By providing a complete and comprehensive picture of dams the author´s work ensures that this book will be a frequently consulted reference for those having frontline experience as dam construction engineers, planners, superintendents, designers and graduate students to increase their knowledge and expertise in this field. 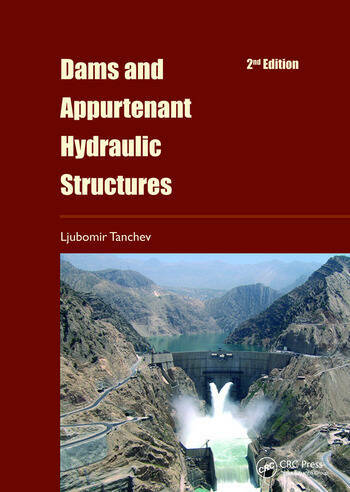 The enhanced 2nd edition of the reference book by L. Tancev on Dams and Appurtenant Hydraulic Structures has recently been published. This is not only an important reference book for dam engineers but all engineers, students and interested people, who want to understand the technical aspects of dams. The author has discussed the various aspects of dam engineering and the possible solutions based on a large number of case studies rather than focusing on pure analysis aspects. It is obvious that before any analysis can be done, the problem and the possible solutions must be understood first and it has to be demonstrated that the solutions are feasible, which is shown by the examples given. […] The author has also shown that many solutions for dams are possible depending on the topography and geology as well as on the flood and seismic hazards at the site. Therefore all dams are prototypes and none is like the other. The emphasis of the book is clearly on dams. However, appurtenant hydraulic structures such as spillways, surface and high head gates, bottom outlets, run-of-river power plants, locks, and pump storage plants are also discussed. This book provides an overview on both the state-of-practice and state-of-the-art in dam engineering and is written in a way that it can easily be understood by non-experts as well. The book is very useful and is highly recommended.